Anyone who has hit the trail with their family knows, it isn't always perfect; someone usually is a bit tired, or a bit sore, or a touch cranky, or the weather may turn and sometimes the full beauty of the area (and the hike) simply isn't really revealed. However, I remember Pickle Springs to be darn near perfect and it would be this trip that truly solidified our family's love and appreciation of the outdoors and hiking. The weather, combined with the natural beauty that Pickle Springs Natural Area offers washed over each of us resulting in our family fully enjoying every single second of this hike, eager and excited to find what would lay around the next bend of the trail. I have a feeling, that if you time it just right, you too can experience a bit of that euphoria as well! 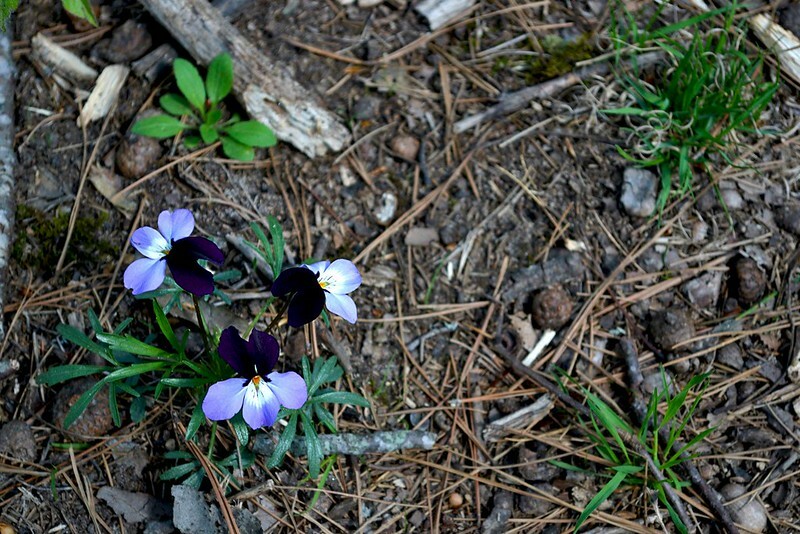 we found along the trail. We ended up at Pickle Springs Natural Area simply by chance, that day we actually were looking to hike through Hawn State Park and the White Oaks Trail, but passed by the entrance and then turned into Pickle Springs Natural Area parking lot in order to reverse direction and head back. But instead of pulling back out of the lot, we decided to take a quick peek of Pickle Springs, and boy, am I glad we did! The two mile loop, "Trail Through Time", has just about everything that you could possibly pack into one trip; seasonal waterfalls, awe inspiring overlooks, incredible rock formations, ancient weathered trees, gorgeous wildflowers, babbling creeks, crystal clear spring water and so much more, all on an easy to navigate and well maintained trail that even features wooden bridges to help you over some troublesome creek crossings. The area was named a National Natural Landmark in 1974 and with so many unique features you will quickly realize why as you hike. 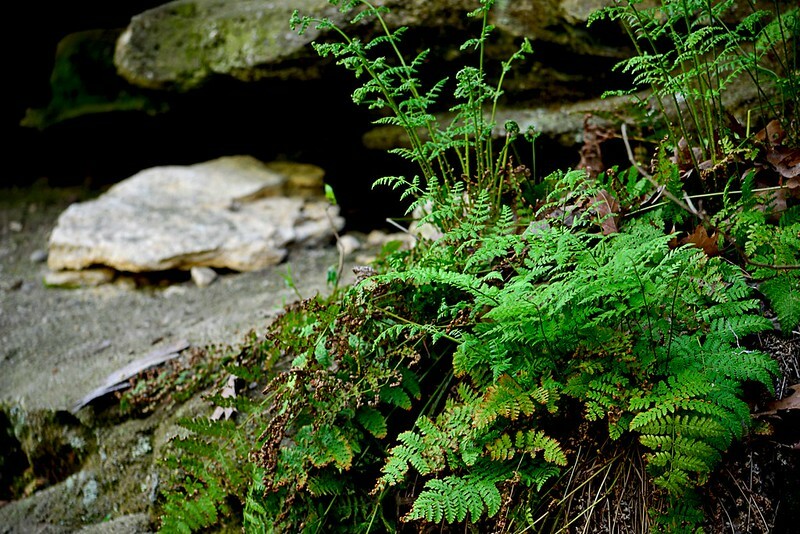 Ferns abound in the wet sandstone soil here. As we began our trek, we opted to head right on the trail, toward Piney Glade, Rockpile Canyon and the Headwall Falls. It was quickly apparent to us that this trail was very well traveled, well packed with a bit of gravel thrown in for measure. The canopy of trees provided just the right amount of sunlight and warmth as we made our way through the forest and provided a perfect scene as the birds sang in the background. Headwall Falls were not really "Falling" but it was still an impressive formation of rocks and with frogs and toads abounding in the area my daughter had the time of her life chasing them about. I marveled at the ferns and mosses growing on the sandstone surface of the canyon while the steady beat of the water as it trickled off the edge and fell to the rocky floor where it would water a great gathering of lush green plants. Pickle Spring is itself an impressive sight, with the clear water flowing, while more water cascades over top, creating a mini-waterfall into the spring pool. The view from the bridge crossing the creek provides a perfect vantage of the spring and may even serve as a great place to dangle your toes into the water, Andy Griffith style. 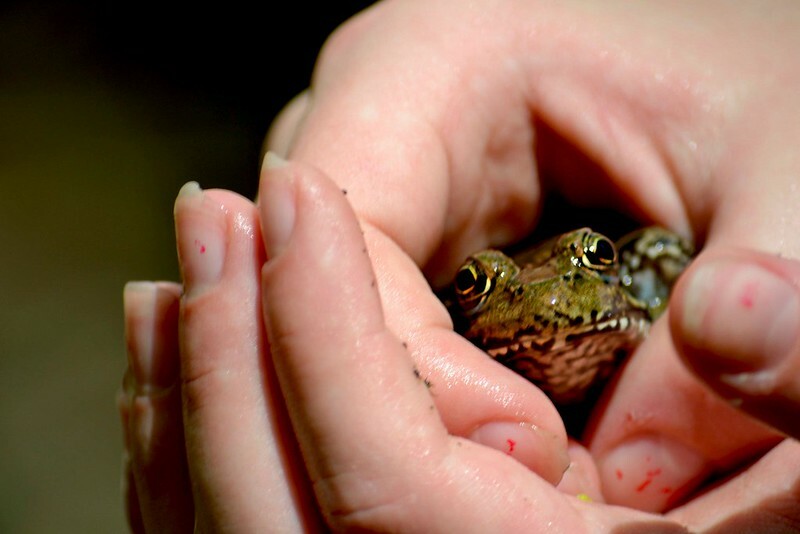 Here we found a great gathering of pickerel frogs who seemed to hop right into our hands! Continuing through it was a short trip up to Dome Rock, marked with so many shallow caves and crags, this rock just begs to be looked at closer. Gathering inspiration at the Spirit Canyon overlook. As you reach Spirit Canyon you will find Missouri's only native pine tree, the short leaf pine, growing in this area, along with white and black oak trees and many of these trees were growing as Missouri was thrown into the Civil War, according to the Missouri Department of Conservation. You may even chance upon a low blueberry bush, as they grow well in the somewhat acidic soil of the area here, if your lucky! 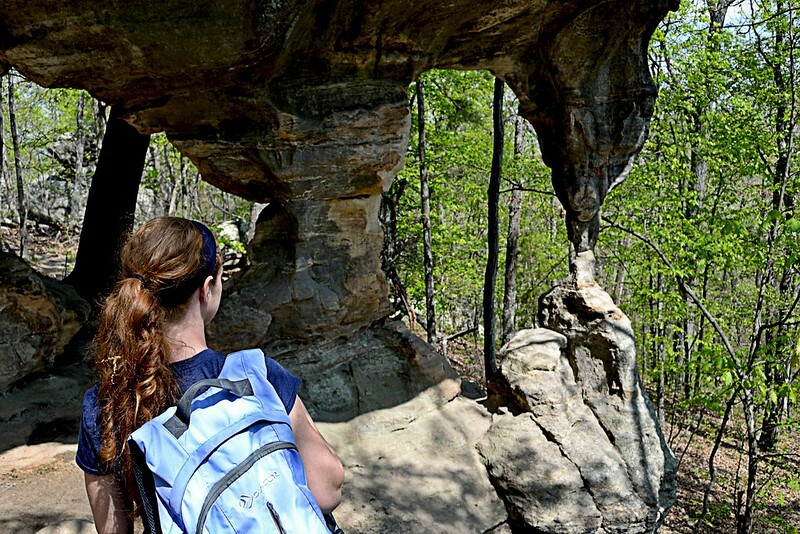 As you actually step up to take in the Spirit Canyon view, know that this may be the best views I have experienced in my Missouri hikes, period. There is nothing "fancy" about the view, and I can't put my finger on exactly why I love this particular vantage point, but it has stayed with me and I can still picture it now in my head. We continued to enjoy the hike, as it meandered near Bone Creek, crossing over the twin bridges and high crossing. Then as we neared the end of the loop we encountered some of the most interesting rock outcrops and formations I have seen. We "squeezed" through the keyhole and made our way past the Cauliflower Rocks, to the Double Arch and, if you're looking to take pictures be sure to save a few for here, as we spent a great deal of time right here, snapping away. As we finished our posing and preening for photos, we made our way out through The Slot and all walked back to the car with smiles I thought may need to be surgically removed. 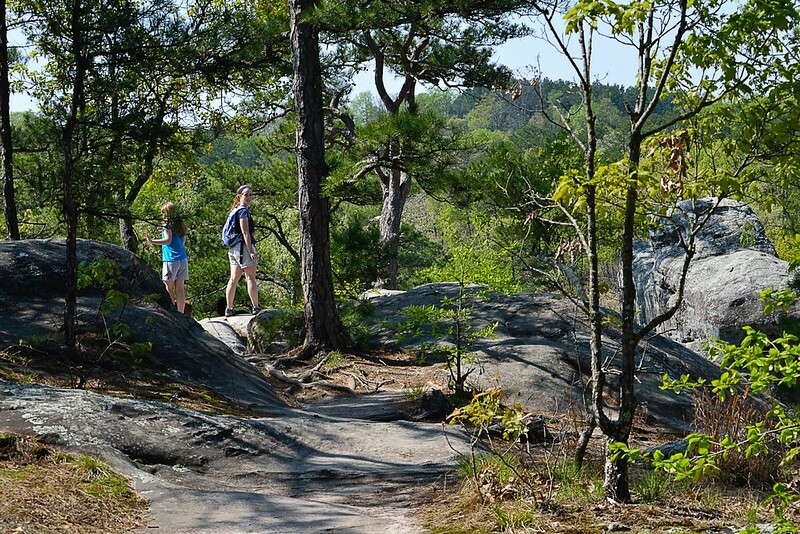 According to many other hikers, the trail takes about an hour to complete, however, we took nearly two. With so much to see and so many places to spend "just one more minute" taking pictures it is easy to extend the traditional hiking time, and these days that time, spent with family having a great time, is overtime I look forward to and can't wait to do again. I hope you enjoy the blog, let me know if you have any questions and thanks for reading! Thanks! It's such a GREAT area to hit up. Hawn State Park gets far more kudos usually, and Pickle Springs is literally a mile or two further down the road... It's completely worth a visit, just don't forget your camera (or to take pictures while you're there)!